Here are some cereal coupons that are still available to print. 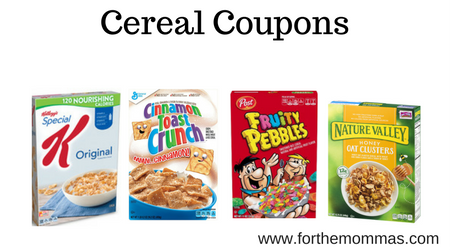 You can save up to $7 with these cereal coupons on brands like Cinnamon Toast Crunch, Post, Kellogg’s, Cascadian Farm & More. Save $0.50 when you purchase ANY ONE (1) Kellogg’s® Corn Pops® Cereal. Valid on 9.2 oz or larger, any variety. Save $0.65 when you purchase ANY ONE (1) Kellogg’s® Krave™ Cereal. Valid on 11 oz or larger, any variety.